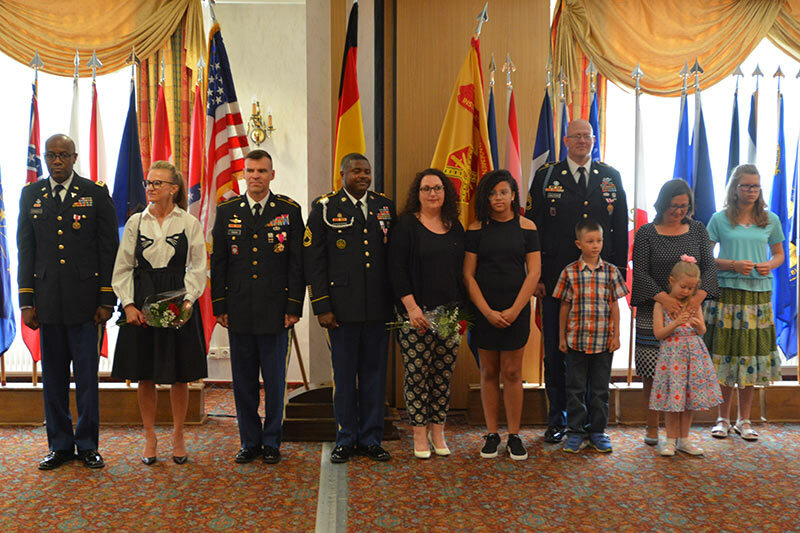 GRAFENWOEHR, Germany — U.S. Army Garrison Bavaria honored Soldiers for their service and career at the quarterly retirement ceremony here May 30. The interim USAG Bavaria Garrison Commander, Lt. Col. Gregory C. Scrivens, thanked the retirees for their accomplishments and sacrifices made in service to the country — in both times of peace and conflict. Four Soldiers in our community retired from the military after years of dedicated service. They included Maj. Glenton I. Atwell, 1st Sgt. Michael V. Toolin, Sgt. 1st Class Benjamin M. Hallford and Sgt.1st Class Marlon S. Laidley. Maj. Glenton T. Atwell accomplished 28 years of service. Most recently he served as the Clinical Nurse Officer in Charge while assigned to the U.S. Army Health Clinic Gafenwoehr, Medical Activity Bavaria. His major highlight was the mobilization on a humanitarian mission to Swaziland, Africa where he provided aid to people in small villages. 1st Sgt. Michael V. Toolin served as the Headquarters and Headquarters Company, USAG Bavaria First Sergeant. One of the highlights in his career was when he conducted Airborne Operations during the 50th and 70th World War II anniversaries. He loves the area and plans to retire in Hirschau, Bavaria. Toolin has one dream he wanted to do for years and now finally he can do it: “I want to ride my bicycle von Garmisch region through Innsbruck over the alps and to Lake Garda and then around Lake Garda,” Toolin said. Sgt. 1st Class Benjamin M. Hallford began his Army career in 1994 and has three years of combat experience. He recently served as the Emergency Operations Center NCOIC in regimental HHC Troop, 2nd Calvary Regiment. One of his career highlights was to drive to Georgia for operations with NATO allies and partners. He plans to retire in northern Alabama to live on a farm and brew beer. Sergeant 1st Class Laidley has six years of combat experience and retires after 22 years of Service as a Motor Sergeant in 23rd Ordnance, 18th Combat Service Support Battalion. His brother, Sgt. 1st Class Ramon Morris, was killed in Afghanistan in December 2014. He and his family — immigrants from Jamaica — share in the pride and sacrifice that his brother made. He plans to retire in Kemnath, Bavaraia. This four Soldiers rendered together more than 127 years of service. Congrats to the newly-retired Soldiers, and thank you for your years of service! More photos at www.flickr.com/photos/usagbavaria/sets/72157695750363631.